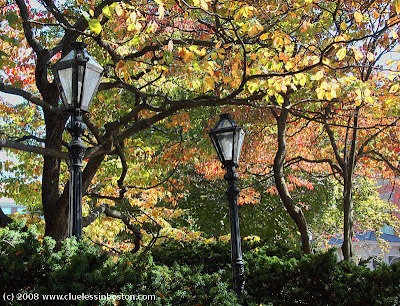 These two lanterns in the foliage look very pretty and fit well in this multicolored tableau. Funny, yesterday I took a similar picture (with a lantern too) but in a different setting. My favourite seson to photograph, her's why. The twisted deep dark tree trunks added a nice balance to the vibrant colours.